This is a really good flavored Matcha. Flavored Matcha is not as common a product as other flavored teas, so it’s an exciting thing to find one. 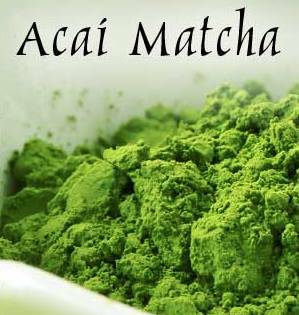 The flavor is a bit different than other flavored Matcha teas that I’ve tried, I don’t know if that is because this is intended to use to make Matcha Lattes. The first time I tasted it, I enjoyed it as I would normally prepare Matcha – that is with some hot water in my chawan and whisk with my chasen. And this results in a pretty tasty tea. The flavor is smooth and rich, with very little bitterness. It is a lot less bitter than I usually experience with Matcha (which is typically a little bitter and a little sweet – a delicious contrast). It is also not quite as vegetative. Prepared traditionally, what I taste mostly is a creamy, sweet and rich tasting tea with mere hints of a vegetative taste (it’s kind of in the background!) and a tart note from the Acai berry. It isn’t an unpleasant tartness, though. I’m really enjoying it. But because I didn’t feel like I was truly experiencing this tea as it was intended, I decided that I should also try this as a latte. I put a few heaping scoops (I used my Chashaku) of the Matcha in my Chawan, and then I made a thick paste using two tablespoons (I eyeball it) of hot (not boiling) water. Then I added steaming milk and whisked it until blended and frothy. As a latte, I notice that I get more froth than I did preparing it traditionally. The flavor is much creamier, and I notice more of the vegetative notes as a latte, but less of the acai berry, which slowly creeps up to the palate in the finish and imparts a lovely tart note. Not a pucker-y type of tart, just a pleasant, fruity tart taste. After trying it as a latte, I decided to get a little more adventurous and try it with some orange juice. So using the same method as before (a few heaping scoops, a little hot water, thick paste), I replaced the hot milk with a little bit of cold orange juice. This may be my favorite way to enjoy this particular matcha because I like the way that the acai berry and the orange flavors mingle. There is very little vegetative taste, it is sweet, slightly creamy, and pleasantly tart. This Matcha is incredibly versatile. It would also make a great addition to a smoothie, if you’re so inclined! I like that the acai berry is subtle, but just enough to help smooth out some of the bitter notes of the Matcha. I really enjoyed my time with this Matcha!